The NB power race was an important race for me as it was a personal advocacy of mine to support any cause that raises hope for Cancer. This was supposed to be the race of my choice for this year (prior to the BKK marathon) and would have wanted to finish strong in this event and probably an improved 21km time. This event was postponed due to the typhoon Ondoy and was actually a blessing for me since I could have missed the event since I was injured at that time. I knew that this run will be more challenging since I was recovering from my first marathon a week prior to this event, and that the 21k course was very challenging as it will pass the Mckinley hill. 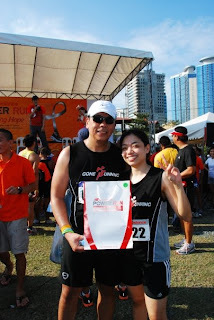 But still, I thought of hitting a 2:30 finish as compared from my last run at QCIM where I finished at 2:48:11. Unfortunately, I struggled in this race which got me too exhausted after crossing the finish line. 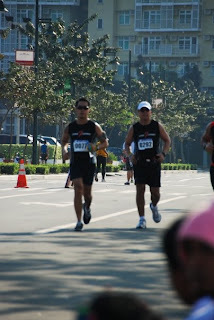 Jay was also recovering from the BKK marathon and told me that he will pace with me and help me reach my target time. In the first 10km, we were still on target with our pace, but after that, I began to feel the stiffness in my left hamstring. It was hard for me to catch up with Jay as he was controlling the pace, I was practically slowing him down since I can’t keep up with the pace (to think that it was a slow pace). 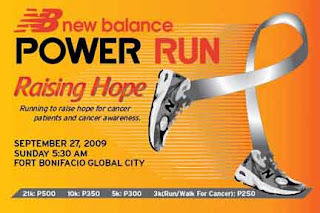 I was trying to psyche myself to avoid any negative thoughts during my run and focused on the advocacy for cancer patients. But “will power” is not enough if your physical strength is just not there. More walk breaks for me after the 13th km and found myself wondering why this was so difficult than the full marathon that I did. Was it fatigue? By this time, I was also feeling pain in my right hamstring. On uphills, I opted to walk as I don’t want to risk my ITB since it just got well after 2 months of healing. It was torture and I was just feeling so tired that I can’t motivate myself to move on. The only thing that was motivating me was to finish the race for the cause. If cancer patients can overcome the pain that they are going through, then this temporary hardship should not stop me from giving them hope. In km 19, I was beginning to have cramps in my right leg and can’t finish a whole km run. 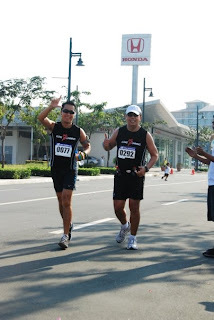 In the final stretch, I tried to jog until I reached the finish line and was limping already due to cramps. I finished at 2:47 together with Jay who decided to run along with me until the finish line. 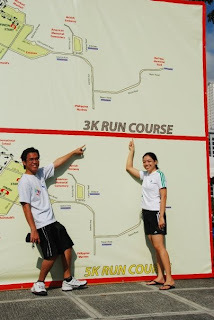 I would also like to mention that this race was Kay’s (my fiancée) first official 3km run together with Tyrone. They finished the course in 27 min (unofficial time). 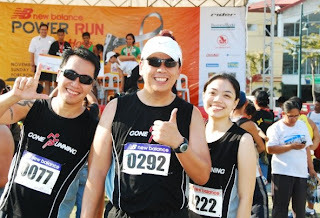 Hopefully they get to run their first 5km in the Mizuno Run in January 2010. Though I ended up exhausted in this race, I am glad to have been part of a cause that was meaningful to the beneficiaries of this event. May we all continue to bring hope to all cancer patients and that we become part of their healing process as they have become part of our strengths. After this race, I will give myself a good rest in order to recover fast. I hope to get back on training in 2 weeks. Won a t-shirt from the bring me contest, Tessa Prieto asked for a pair of NB shoes, luckily I was wearing one. 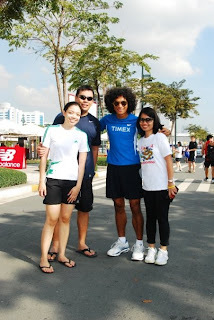 Kay, Me, and Noemi with coach Rio.